All pressure transducer accessories for the FPM100 are fitted with 1/4” NPT male threads. Some pressure transducers measure gage pressure (pressure above atmospheric). These transducers have a small plastic vent tube enclosed in the connecting cable. Special care must be taken not to block or kink the vent tube, and not to expose the vent tube to moisture. Keep in mind that the rated burst pressure of the pressure transducer is 2.4 to 3 times the maximum measurement pressure of the transducer. 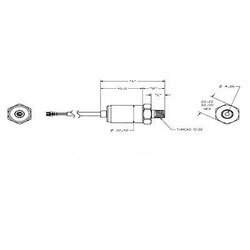 If the pressure transducer will experience pressure spikes in excess of the transducer’s maximum measurement pressure, use of a Pressure Snubber (PT-SNUB-01) accessory is highly recommended. The snubber will dampen pressure spikes that will be seen by the pressure transducer.